Seastrom Manufacturing - Formed nuts in cold rolled steel. Formed sheet metal nuts are also known as speed nuts or clip-on nuts. Speed nuts are designed with two sheet meal prongs that act as one thread which provides a full 360° grip. 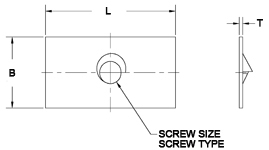 The more the screw is tightened enough force thru the prongs to the screw that it keeps it from loosening under vibration. They are a form of locknut which serves the functions of both lock washer and nut, which saves assembly time and money. Use our Quick Search below to source steel (cold rolled steel) formed sheet metal nuts from our wide selection of options. Did you know Seastrom is more than formed sheet metal nut? We manufacture and stock over 44,000 part numbers to make your washer & fastener sourcing job easy.